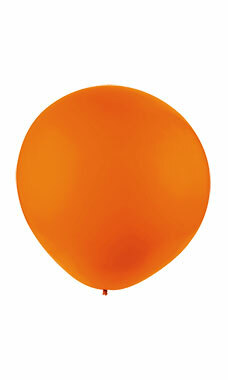 These top-of-the-line 64" Orange Gigantic Display Balloons commands attention wherever you direct it. These balloons are made of high-quality latex and has a slender neck for easier inflation. Actual flying time will vary depending upon inflation size, temperature, and atmospheric conditions. Any accessories used to seal and fly the balloon will increase the weight and may decrease flying time. The Gigantic Balloon should be brought indoors during the evening and bad weather, including rain and wind. Short term use, not re-usable.